The Liberation Tigers of Tamil Eelam (LTTE ) are holding on to just a sliver of land in the north of Sri Lanka, but the United Nations is estimating that 50,000 people are still trapped in the war zone. As fighting surges in the final throes, concerns for civilians is growing and calls for international attention and understanding abound on the Internet and in the streets of cities around the world, such as London , Berlin  and Paris . Should we help the Tamils? is now a burning question in Canada. But many bloggers are questioning the information people abroad are getting about the island's long war. 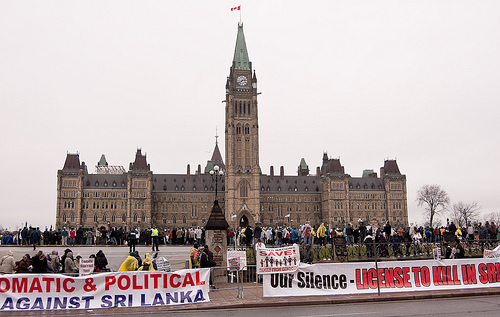 The international media reports have been inadequate or inaccurate, while the Sri Lankan government is blocking access of journalists to the north  where civilians are in danger.